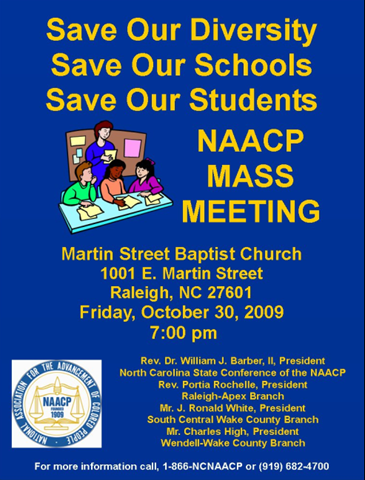 The Capital Area Branches NAACP (South Central Wake –Raleigh/Apex–Wendell Wake Co) branches are calling a Mass Meeting at the Juniper Level Baptist Church 9100 Sauls Road Raleigh on Sunday at 6:00 PM. This mass meeting is to inform the community of the importance of voting in the District 2 race. We will attempt to show how this race will form the future of the Wake County Schools, and educate the community on the future of our children. Please pass the word around to all of your friends and family. Have a voice in our children’s future! Please announce in all Churches and other places that can carry the word out for us. On this week`s edition of NC SPIN we`ll talk about the state of ethics in our state, a possible gusher of water wars, reforming our tax codes and bonded term limits. Tune in! Welcome to this week`s electronic update from NC SPIN. The panel includes: Chris Fitzsimon, Director of NC Policy Watch; John Hood, President of the John Locke Foundation; Ruth Sheehan, columnist with the News and Observer and former Lt. Governor, Dennis Wicker. Tom Campbell will moderate the discussion. With all the news about corruption in government a topical question is Who Do You Trust? This Carolina Community was named after a stranger who wandered into town. Regardless of how the State Board of Elections decides to deal with former Governor Mike Easley and those who surrounded him our state is the big loser. We should feel repulsed and embarrassed about the sorry state of politics in North Carolina. The courts will determine whether or not laws were violated but one inescapable conclusion is that good judgment, moral principles and respect for the office were thrown out the window. People who had resources and power believed they were entitled and deserved to bend rules for their own advantage. John Hood, in today`s Carolina Journal, says that before we focus on blaming the system we need to first and foremost understand this is a problem of the perpetrator(s). And it isn`t just Governor Easley who is indictable. Anyone with more than a casual knowledge of the way politics works in this state knows, repeat KNOWS, that both political parties accept money designated for the benefit of specific candidates. They deny, deny, deny, then wink and turn their heads to the practice, primarily designed to escape campaign contribution laws. Where are these folks when this discussion is being held? Suddenly they become deaf, sitting on their thumbs. Nobody who ever participated in party politics will step up and admit what goes on. How can they act indignant when they are complicit? It is going on right now, as we write this newsletter. Michael Hayden, the fundraiser for Easley, is currently at work trying to raise money to help Governor Perdue eliminate her campaign debt. Sources tell us Hayden is approaching contributors to give money to the Democratic Party, earmarked to help retire Perdue`s debt from the 2008 campaign. This is exactly the problem with politics and most everything else in our culture today. Good people sit quietly while transgressions occur, thinking that if something doesn`t directly hurt them they can turn their heads. There is no right and wrong anymore, just what is right or wrong for me personally and I can justify almost anything to get what I want. I am entitled. It is appropriate to comment on the process so far. It is obvious that the staff of the State Board of Elections has done a great deal of investigation into the matters, as evidenced by the exhibits that have been presented to date. In general we think Chairman Leake and the board has done a fair job of the hearing. The first day we thought their conduct of the hearing was pretty good and they appeared to have some method to their line of questions. The second day was horrible and they let witnesses off the hook too easily. Yesterday`s questions of the Governor were deferential, as perhaps they should have been. Overall their questioning has been somewhat disjointed, frequently failing to follow up on obvious questions in response to testimony and, especially in the case of member Bob Cordle, have appeared shamelessly partisan. Cordle should be embarrassed for his conduct in this case. The proceedings got off on perhaps a wrong foot the first day, when it was revealed that the Governor`s former Legal Counsel, Ruffin Poole, had filed action to have his testimony quashed. We were of the opinion this might be sough because of attorney-client privilege. Today`s News and Observer reports that isn`t the case. But the motion was heard behind closed doors and the true reason for Poole`s refusal to testify has not been given by either the judge hearing the motion, Poole, the Governor or the State Board. Testimony given at the hearings indicates that at least on one occasion Poole was contacted to help with a permit by Gary Allen. Speculation is that Poole`s testimony is relevant in the federal case involving Easley and anything he says might adversely affect the case which is still being assembled. Whatever the outcome of these hearings, this matter will likely remain a mystery. Today`s Under the Dome blog has a good summation of the key items disclosed so far and the decisions the Board of Elections must face. They include the 2000 GMC Yukon provided the Easley`s. Was it, as the Governor asserted, primarily for the use of the campaign or was it, as car dealer Bob Bleeker testified, primarily for the use of Michael Easley? Should it have been reported on campaign reports? Was the omission perjury or just a violation of campaign laws that must be corrected? The matter of air travel has been focused entirely on flights provided by McQueen Campbell. Do we believe the Governor that he thought they had been reported and paid or do we accept Campbell`s version of the contribution? Repairs made to the Easley home are an interesting subject. Paying for them out of campaign funds was not prohibited at the time, especially since the home was “rented” to the campaign during some of this period. We would love to see more documentation as to whether campaign funds were given to Easley for rent of the house. Was insurance fraud committed? Shouldn`t it be easy to find who filed the insurance claim, for how much, who was paid and where the money went? This line of questioning was inadequate in our opinion. Donations to the Democratic Party made after donors had “maxed out” (given $4,000 per campaign) are also subject to further investigation. Again, we would assume a paper trail could be followed that might affirm or deny how those contributions were used. Today`s hearings are supposed to conclude with one witness, Scott Falmen, former Executive Director of the NC Democratic Party. Falmen denied repeatedly, under oath, that money given by a campaign`s donors could be designated for specific use for the candidate or that the candidate could instruct the Democratic Party how to spend those funds. Having said this, however, he also admitted some $500,000 was expended as “in kind” contributions on behalf of the Easley campaign. For his part, Falmen has led the board into a highly-detailed, often confusing description of the way funds are handled by the Democratic Party, all trying to logically explain that the Party doesn`t have slush funds or accept funds earmarked for a candidate. The board must determine whether they believe there was a direct connection between the giving and spending. One revelation today was that “reattributed” contributions, those moneys coming from donors who have “maxed out” and have agreed to have their additional contributions “re-attributed” or “re-designated” to the Democratic Party, go into a federal account and are not under the purview or reporting to the State Board of Elections. This is likely to be worrisome to the board. Falmen tried to explain how this money was to be used, but your reporter remembers the admonition of former State Treasurer Harlan Boyles, that once money goes into a pot it often becomes fungible, meaning it can be moved from purpose to another. The Board of Elections must decide what to do with all the testimony they have received. Clearly there are conflicting versions on several points. At the least we expect the Easley campaign will be fined for failure to report in a timely manner the car and flights. We suspect the board will have a hard time sorting out who is telling the truth and who isn`t and will likely refer the matter to Wake District Attorney Colon Willoughby for further legal action. This is standard procedure and means the investigation and possible prosecution will then become a state legal case. This could present an interesting scenario. It is widely rumored that Willoughby and Easley are hunting buddies. If the State Board remands the case to him, as prescribed by law, will Willoughby recuse himself from this case due to conflicts of interest? If he does who will then become responsible for prosecuting the case? Attorney General Roy Cooper? Aside from possible further legal action, the question many are asking is what should be done to try to prevent future moral and ethical lapses? Expect a growing cry to tighten laws regarding political parties. We expect to see a move that would limit the amount of money that can be given a political party to the same amount allowed to be given a candidate. It is obvious that there need to be restrictions on how much money can be given as “in kind” or even direct contributions to a specific candidate…again restricted to the same amount as is currently allowable by state law. The imposition of these two provisions would effectively eliminate the large contributions given by leadership (Democrat and Republican) to their parties and thus would take them out of the relatively recent practice of being the main campaign fundraisers for candidates. But the Easley testimony points to another reform needed. The Governor reported that he had never seen a campaign report to the best of his knowledge. While we can understand that much goes on in a campaign and that the candidate must be the one connecting with voters and probably not directly involved in all the decisions for expenditures, but the candidate should be the person with ultimate responsibility to ensure that his or her campaign abides by not only the letter but the intent of the law. After all, if a corporation breaks the law it is generally the CEO who takes the fall, either by being fired or going to trial. The same should be the case with candidates and we are informed this isn`t necessarily true now. Further, we would pass a law saying that each candidate must personally sign a statement to the effect that he or she has reviewed the campaign finance report and it is true to the best of their knowledge. This requires that they at least read what is being submitted to the state. We won`t likely know the end result of this action today but we repeat that it is a sad commentary on our political system and process when so much time and energy must be spent exposing people who don`t do the right thing. Look for a discussion about the state of ethics in our state on this week`s NC SPIN and a full recap and evaluation on next week`s program. Despite the fact that the second place finisher in District 2 has announced she concedes the election, is withdrawing from the race and will not serve if elected, a runoff election will be held next Tuesday for the post. Why? The State Board of Elections says there isn`t a process for stopping the election after a candidate has called for a runoff. Wake County will spend about $30,000 on printing ballots, manning polls and counting the vote. But not all are unhappy with the State Board`s verdict, including the NAACP. They, and other groups, are planning a big get out the vote effort to see that the apparent winner of the election will not be seated. We took a look at a sample ballot and there is a place for a write-in candidate to receive votes. How can this be in a runoff election between two candidates, you ask? After all the general election was held and these two candidates emerged as the top two vote getters. How could a write-in candidate possibly be allowed to win? This could become another interesting topic for discussion but we hear a write-in campaign could be underway on behalf of the current board member who was defeated in the first vote for the seat. One observer remarked that people were too complacent the first time and now they recognize the need to turn out the vote to preserve the diversity policy of Wake Schools. I don`t know about you but this looks like a lawsuit waiting to happen. Mecklenburg District Judge Bill Belk, from the storied retail family, told the Charlotte Observer that the Judicial Standards Commission will recommend he be removed from the bench. Belk is outraged. Let us see if we understand your position Judge Belk. On the one hand you are arrogant enough to insist upon maintaining your position on corporate boards and verbally lambasting the Chief District Court Judge but on the other hand think you should be allowed to pass judgment on the common folk who come before you. Is that pretty much it, Judge Belk? Go figure why the Judicial Standards Commission should ever have a problem with this. The Supremes will make the ultimate decision but we suspect they won`t be impressed with Belk`s position. We have to report on the son of our Editor, Claire Cox-Woodlief. Jonathan, an eighth grader, wasn`t happy about the new changes on Facebook (if you have to ask, you wouldn`t understand anyway) and logged on to a Facebook group protesting the changes. He noticed that the administrator`s role in the group had been vacated and signed up. What happened next is something you would expect in a Hollywood movie. People from all over the country and the world have heard about the group and logged on. Media outlets from all over are calling for interviews. Facebook created the social network phenomenon. Now they have to deal with the consequences of it. Sweet justice, eh? Will you help cure Juvenile Diabetes? Longtime readers of this newsletter will know that our grandson, Hart, was diagnosed with Type 1 diabetes several years ago. Now 15 years old, Hart has to frequently monitor his blood glucose levels and inject insulin into his body to maintain proper levels. The Juvenile Diabetes Research Foundation raises money to speed up the process of finding a cure for the millions of young people who have this disease and 80 percent of the contributions they receive go directly to research. Once each year we ask you for help. Our family joins thousands of others in a Walk to the Cure, which this year will be held November 7th. We have set a goal for raising $2,500 and today we are 43 percent of the way in achieving our goal. Would you be willing to help us? We will match your donation dollar for dollar for the next $1,000. You can contribute now. Our family thanks you for your generous help. If you ever miss the telecast (or radio broadcast) of NC SPIN, here`s good news. You can view each week`s show via webcast. It`s easy. Just go to www.NCSPIN.com and click on the “view webcast” button under the webcast box on the upper left hand side of the home page. Shows are updated by noon each Sunday. Archived copies of the show are available there too so you can go back and catch up on any shows that you have missed. Tell your friends! Become a fan of the NC SPIN Facebook page and join the discussion! Until next week, watch out for the SPIN! This message was sent to cdancyii@embarqmail.com. To manage your preferences, please click here. AMOUNTS OF INFORMATION AND IDENTIFY MINUTE OR OVERLOOKED DETAILS. STATE OWNED VEHICLE IS AVAILABLE). WITH CONCENTRATION IN CRIMINAL LAW. OFFENDER REGISTRY BACKGROUND SEARCHES AS A CONDITION OF EMPLOYMENT. You must complete a Judicial Branch Application for Employment (AOC 133) to be considered for this position. Degrees must be received from appropriately accredited institutions. The vacancy system is provided by the Office of State Personnel. Individual vacancy information is provided by each agency/university. Washington, D.C. – Congressman G. K. Butterfield applauded the revised health insurance reform legislation put forward by the House today. The Affordable Health Care for America Act, released today, blends and updates the three versions of previous bills passed by House committees in July. It embodies President Obama’s key goals for health reform – it will slow the growth in out-of-control costs, introduce competition into the health care marketplace to keep coverage affordable and insurers honest, protect people’s choices of doctors and health plans, and assure all Americans access to quality, stable, and affordable health care. The legislation will ensure that 96 percent of Americans will be covered by a quality, affordable health plan. The Congressional Budget Office (CBO) estimates the cost of expanding coverage at $894 billion, consistent with the $900 billion coverage mark laid out by President Obama. And, according to the CBO estimates, the bill reduces the deficit by at least $30 billion over the next 10 years. Butterfield also said that he is pleased that the bill includes a public option. The public exchange would also be open to small businesses staring in 2013, when firms with up to 25 employees could enter the exchange; in 2014, firms with up to 50 employees; in 2015, firms with up to 100 employees; in 2015 and beyond, the Commissioner could allow larger employers as appropriate. Butterfield said there has been a long and purposeful process in developing the legislation. The House has held about 100 hearings on health care since 2007, and House members have held nearly 3,000 health care events across the country, including Butterfield’s health care town hall meeting held this past August in Rocky Mount, N.C. Additionally, three House committees have spent 160 hours on hearings and markups of health care legislation. Butterfield also said the bulk of today’s proposal has been available for review and comment for more than three months. “This has been a deliberative process on an enormous issue in need of immediate action,” Butterfield said. · Reduces the deficit by $30 billion over the next ten years, and continues to reduce the deficit of the second ten years. · Provides a mechanism for addressing the Medicare payment system that takes geographic differences into account. · Begins to address the issue of medical malpractice by establishing a state incentive grant program to encourage states to implement alternatives to traditional medical malpractice litigation. · Allows for the creation of State Health Insurance Compacts by permitting states to enter into agreements to allow for the sale of insurance across state lines when the state legislatures agree. · Limits any surcharges to millionaires – only the wealthiest 0.3% of Americans would pay a surcharge in order to make health insurance affordable to middle class families. · Exempts small businesses with payrolls below $500,000 – or 86% of all America’s businesses – from the mandate to provide health insurance. · Immediately begins to close the Medicare Part D donut hole. The Urban League of Metropolitan Denver received its affiliation in 1946. The Metropolitan Denver affiliate service area includes approximately 200,000 residents of the 1,000,000+ population, within an eight-county region. The number of Hispanics residing in the area is above the national average. The number of Blacks is below the national average, and the number of Asians and American Indians is near the national average. Approximately 97,809 Blacks reside in the Denver Metro Region. Additional information regarding the Metropolitan Denver affiliate and its service area is available on the web at www.denverurbaneleague.org. Major corporations in the immediate area include IBM, Lockheed Martin Corporations, US West, MillerCoors, Time Warner Cable, United Airlines, King Soopers, Inc., Norwest Bank Colorado, Samsonite Corporation, AT&T, Safeway Stores, and Gates Corporation. Numerous colleges and universities reside in the metro area such as University of Denver, University of Colorado at Denver, Regis University, and Colorado State University at Denver. On the sports side, there are the Colorado Rockies Baseball Club (number one record for attendance), Denver Broncos Football Club (Super Bowl Champions), Denver Nuggets Basketball Club, Colorado Avalanche Hockey Club, and the Colorado Rapids Soccer Club. On the cultural side, Metropolitan Denver has the Denver Museum of Natural History, Denver Art Museum, Children’s Museum, Denver Center for the Performing Arts and the world famous Denver International Airport. Ø Directs, plans, and implements overall policies and objectives of the organization in accordance with the national charter and board of directors. Ø Provide leadership to the organization, administering its functions and operations to ensure the mission and programs are delivered to the community. Ø Develop, articulate, and communicate a vision for the organization. Ø In concert with the Board, develops long term strategic and annual operating plans. Ø Directs financial planning, accounting, budgeting, procurement, staffing, internal and external communication, systems needs, and investment activities for the organization. Ø Acts as the principle spokesperson, in conjunction with the Board Chairperson, representing the needs and interest of the affiliate in the community. Ø Networks to identify funding sources to ensure positive impact on the affiliates’ finances such as corporate solicitations; United Way; funding source proposals; annual campaigns; capital campaigns; governmental funding, etc. Ø Initiates and maintains relationships with staff, board, political, corporate, and community leaders. Ø Develops and implements systems of internal controls to safeguard organization funds such as: ensuring fiscal accounting and reporting is in accordance with standards of accounting for voluntary non-profit organizations. Ø Prepares reports or directs preparation of reports summarizing organization’s current and forecasted financial position, business activity, and reports required by regulatory agencies. Ø Analyze and classifies risks as to frequency and financial impact of risk to the organization. Ø Determines staff accountability and authority for receipts, disbursement, banking, protection and custody of funds, securities, and financial instruments. Ø Analyze past, present, and expected operations. Ø Reviews financial statements and activity reports to ensure that organization’s objectives are achieved. Ø Advises the board of economic objectives and policies, investments, and loans for short and long-range financial plans. Ø Keeps abreast of issues facing the African-American, and minority community. Ø Bachelor’s degree (master’s degree preferred) with a minimum of five years of successful public administration, business and non- profit management experience. Ø Knowledge of economic, accounting, and budgeting principles and practices, the financial markets, banking and the analysis and reporting of financial data. Ø Knowledge of business and management principles involved in strategic planning, resources allocation, human resources modeling, leadership technique, and coordination of people and resources. Ø Knowledge of laws, legal codes, court procedures, precedents, government regulations, executive orders, and democratic political process. Ø Ability to monitor affiliates’ fiscal administration to ensure accordance with Standards of Accounting for Voluntary Non-Profit Organizations and agencies. Ø Knowledge of principles and methods of showing, promoting, and selling products and service including fund raising, marketing strategy, tactics, product demonstration, and sales techniques. Ø Ability to communicate orally and in writing information and ideas so other will understand. Ø Ability to network on the local, state, and national level to ensure expanded affiliate fundraising and awareness level, including grant and proposal writing experience. The Urban League of Metropolitan Denver is located in the National Urban League’s Western Region. Mr. Jerome Whitney is Board Chairperson. NOTE: For certification consideration please submit an up-to-date resume to: Jerome Whitney, Urban League of Metropolitan Denver, Inc., 2015 York Street, Denver, Colorado 80205 on or before November 13, 2009. URBAN LEAGUE EMPLOYEES WITH AN ACCEPTABLE LEVEL OF EXPERIENCE WOULD BE A PLUS. First of all this makes the third forum that I have attended in which the first two only consisted of Tarboro Town Council candidates. When I heard about forum number three and Princeville candidates were invited, I knew I could not miss that one because I knew it would be some drama. I know that from attending the Princeville Town Commissioner’s meetings. It is so damn funny that so many folks who run for an elected office don’t have a clue of what the duties consist of. So during their campaign speeches and etc. they mislead folks about what they will and can do. Some folks claim they know the roles of the office they are seeking but the majority of them have repeatedly said that the main role is to do what the people want them to do. Not necessarily because their role should be to educate the people about what is going on so they can make an informed decision but hell half the time the elected officers don’t have a clue. At the end of the day the elected officer must listen to the people but also keep in mind that they must vote for what is in the best interest of the people and not solely vote on emotions of the people. Every elected officer must recognize and understand that they must stay within the policies and procedures. I am going to share my concerns about the following candidates. John Wooten (black male) – I started out trying to follow him however after three forums he has lost me. I don’t know him because he moved to Tarboro recently. I feel he means well but he needs to learn the real role of the office that he is seeking. Rev. Roy Gray (incumbent) and Taro Knight both black males whom I know too well. Many folks have asked me who do I feel will win this election? I said I believe whichever one that takes the most voters to the polls and they vote for them then that is who will win. But there will be a problem if one candidate takes voters to the poll and they end up voting for the opposite candidate. However my personal opinion of Gray and Knight is that they are both equal. Knight has been Gray’s campaign manager for many years and up until now he has gone along with everything he has done but for some reason he wants to run against him. I am still asking the question why? They both have worked hard for Senator Clark Jenkins District 3 for several years now and they have gotten paid well. Neither candidate impresses me. I don’t think it will really make a difference which one is elected. Theresa Richardson sounds very intelligent and very compassionate however I do not know her. I feel she has some experience because she has worked for the town. I believe I would vote for her if I lived in Princeville because I would hold her accountable and would push her to become a seasoned mayor. Priscilla Everett-Oates (former mayor) has no clue that she is one of the reasons why Princeville has suffered over the past several years. Mayor Delia Perkins (incumbent) I believe have kept the town together however I have not been impressed with the way she carries out her meetings. I know there is a lot of tension in Princeville especially during their monthly meetings but I believe the meetings could be carried out much differently. During the flood Perkins did not allow the citizens to voice their opinions and they voted her out. With the way the meetings are carried out, I feel that she could be easily voted out again. One good thing is that Perkins have resources and that goes a long ways when serving in an elected position. Isabelle Purvis-Andrews (former commissioner) has no clue that she is one of the reasons why Princeville has suffered over the past several years. She and the former mayor Everett-Oates were a team then and still a team now as they have continued to attend the monthly meetings since they both lost their seats. In my opinion the questions and/or comments that they ask of the current commissioners should be addressed to Everett-Oates. Ann Carney Adams (incumbent)seems to be doing the right thing. She seems to be very compassionate about her role as a commissioner and I feel she holds herself together very well during the meetings. If I could vote I would vote for Adams. Calvin Sherrod is seeking to unseat Carolyn Sharpe. Sherrod is a part of the Purvis-Andrews and Everett-Oates team. He too don’t have a clue. Carolyn Sharpe didn’t attend due to her daughter having surgery. If I could vote I would vote for Sharpe. Forwarded per J. Ronald White, President South Central Wake County Branch.